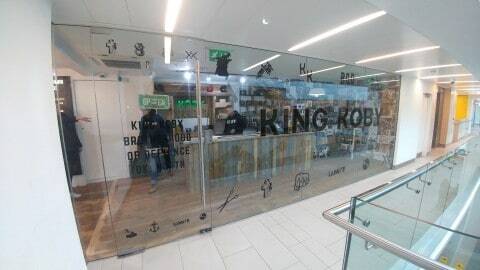 As their business has gone from strength to strength, the institution that is King Koby needed an additional venue to cater for the demand. 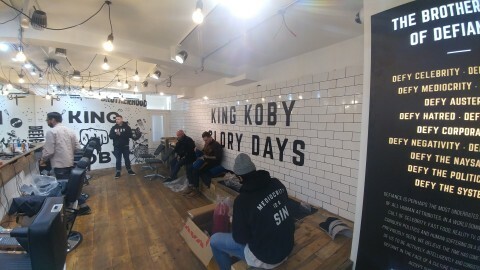 The boys from King Koby approached us to sort out all signage for their new shop above Denham in Leeds City Centre. With a full window front and full tiled wall, we had two great canvases to work with to show off Koby’s strong brand. For the window vinyl, we reverse cut the logo out of black vinyl and used a bronze vinyl as the outline of the letters for more impact. The logo was then surrounded by various shapes and emblems that represent the King Koby Culture. On the inside of the shop there was a full white-walled tile that was screaming out for some contrasting black vinyl on there. We used a special type of vinyl here which contours to ridges and curves. The end result was strong, with KING KOBY GLORY DAYS displayed proudly. We thoroughly enjoyed working with King Koby, a great bunch of lads who are clearly passionate about their work and the brand. To read more about the King Koby story and see what they do, visit kingkoby.com.